The classic combination of a hard, blue and soft cheese. Accompanied with Poppy & Linseed Crackers. Creating the unbeatable and simple combination of a hard cheese, soft and blue, we have combined 250g each of Paxton & Whitfield's Cave Aged Cheddar PDO, Finest Stilton PDO and our Camembert de Normandie PDO. 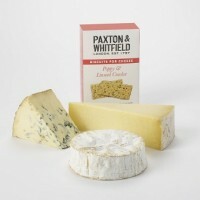 Accompanied by the perfect biscuit to eat with all three delicious cheeses, Paxton & Whitfield's Poppy & Linseed Crackers. This great collection fits perfectly into our Medium Gift Box.